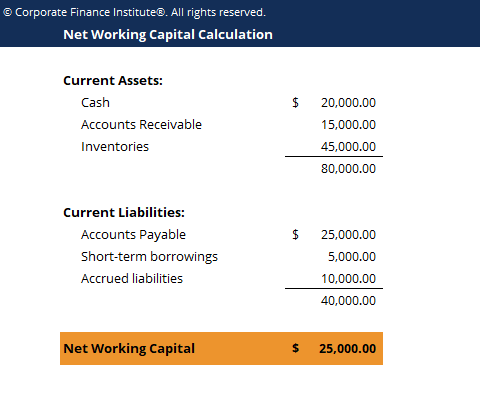 Net Working Capital (NWC) is the difference between a company’s current assetsCurrent AssetsCurrent assets are all assets that can be reasonably converted to cash within one year. They are commonly used to measure the liquidity of a company. A company’s assets on its balance sheet are split into two categories – current assets and non-current assets (long-term or capital assets). (net of cash) and current liabilitiesCurrent LiabilitiesCurrent liabilities are financial obligations of a business entity that are due and payable within a year. A company shows these on the balance sheet. A liability occurs when a company has undergone a transaction that has generated an expectation for a future outflow of cash or other economic resources. (net of debt) on its balance sheetBalance SheetThe balance sheet is one of the three fundamental financial statements. These statements are key to both financial modeling and accounting. The balance sheet displays the company’s total assets, and how these assets are financed, through either debt or equity. Assets = Liabilities + Equity. It is a measure of a company’s liquidity and its ability to meet short-term obligations, as well as fund operations of the business. The ideal position is to have more current assets than current liabilities, and thus have a positive net working capital balance. The first formula above is the broadest (as it includes all accounts) and the second formula is the most narrow (as it only includes three accounts).